Today is themed furniture day. We have 8 fantastic furniture makeovers in the tour! I was excited when we announced the numbers theme last month. I’m always excited when the theme is announced but then I agonize for 3 weeks over how to interpret the theme. The furniture piece I first selected for the theme was a chest of drawers. I went to Hobby Lobby and picked up an extra stencil and headed home. I made one stop on the way home. For the most part I do not shop thrift stores anymore because frankly they are too expensive. The used furniture prices have gone crazy the last year. The table was $20 so the price was reasonable. I could see the table top stenciled with numbers, so I brought it home. The iron legs and curvy details make this table look expensive. 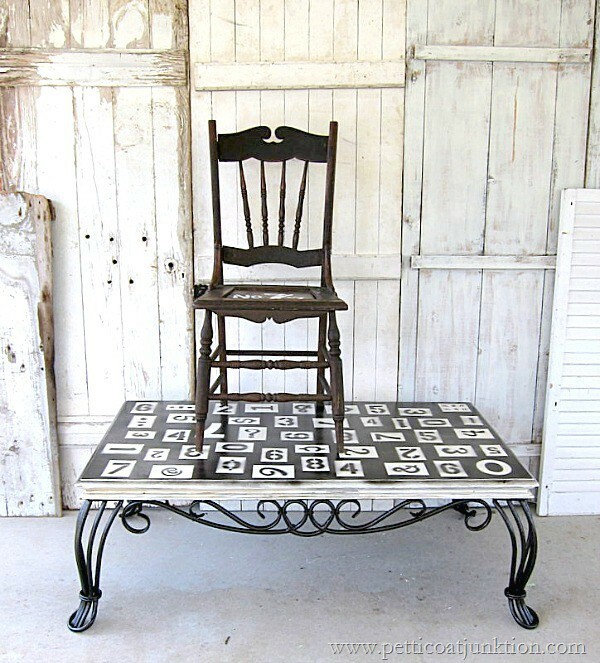 At the last minute (before the photo shoot) I decided to do a quick numbers job on one of my vintage chairs. When I share the tutorial on these projects next week you’ll see how the chair became no. 77. What do you think….you know you can count on me to reply to your comments. Take the “number” tour below….. This is such a cool project Kathy! I’d love for you to share it at my Twirl & Take a Bow Party, if you get a chance. Awesome Kathy. 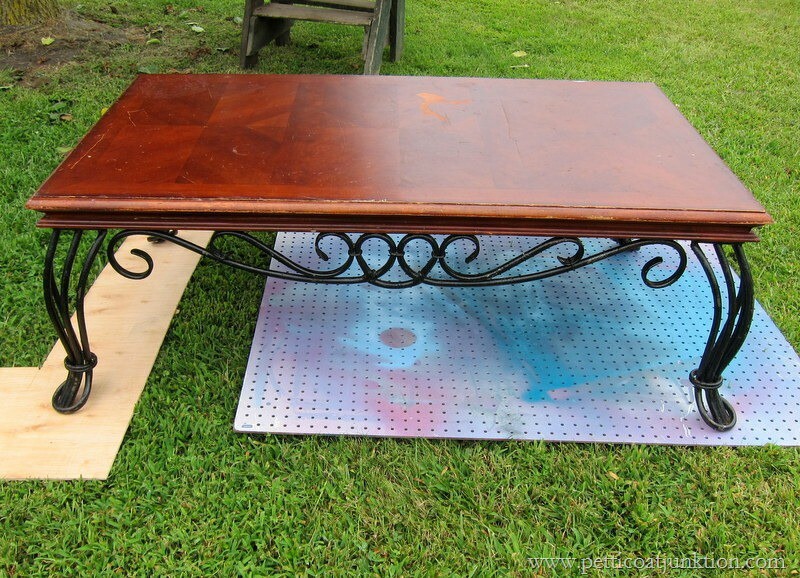 There was a coffee table similar to yours at our local thrift shop for $15. I was very tempted to buy it but hubs was naysaying. No matter what I find at thrift stores he constantly tells me “you don’t need that”. He means we don’t have room for it and not putting it in my shed til you decide what to do with it. I was thinking of changing that table for patio table we’ve been using for coffee table for some time now. It has nice wrought iron dealies on it and legs with plain wood top, don’t think it was original top, had idea to put some thing on top of the top and pretty it up. I so agree about prices of furniture at thrift shops. I get really aggravated at places but it’s like biting off my own hand when I don’t buy a piece I really like. Think this old lady is going to back to thrift store tomorrow (by myself) to get that table. Hmmm how will I fix it up to use in our l/r? I also have two end tables out in big shed to fix up. Maybe do a 3 some to get them done. Love your vintage chair. We have an oak chair with wicker woven seat I’d like to redo but hubs might rebel. It’s been sitting out in shed for years now, not used, I’m going to ask to find out. I love chairs, have never done one so it’s time to find out if I have it in me to redo one. 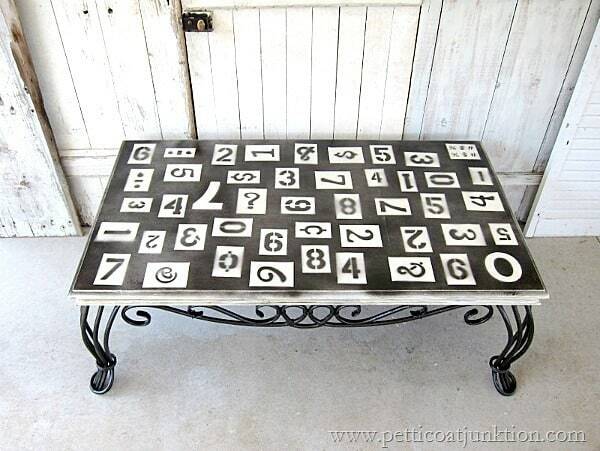 Your table with numbers is awesome, great idea to cover the top. I love theses! Love the black/white/number combo. And I agree about the thrift store prices! I don’t shop there much any more either. Love them both Kathy! Such a neat idea using them randomly on a table. I’m in love with the chair too! Such a fun tour this month. I can’t wait to jump in with you all next time around! I love this !!! great idea!! Hi! I just started following you on facebook and I love your work! I’ve recently started redoing some furniture, just for my own house, and I am having so much fun! Your projects are a huge inspiration to me! I found this awesome chest sitting with the trash next to my in-laws house the other week and I’m going to try your white-wash technique on it since it has a beautiful raised tree pattern on the 2 front doors. I would love to know where you go to find all your treasures? Although I don’t live near you maybe I could look for places near me! Kathy these came out awesome! I love how you gave the table a slightly industrial feel with those numbers and that chair 😉 it needs to come live in my house! Beautiful job! Kathy you totally transformed that table- it’s so much more hip and industrial now. 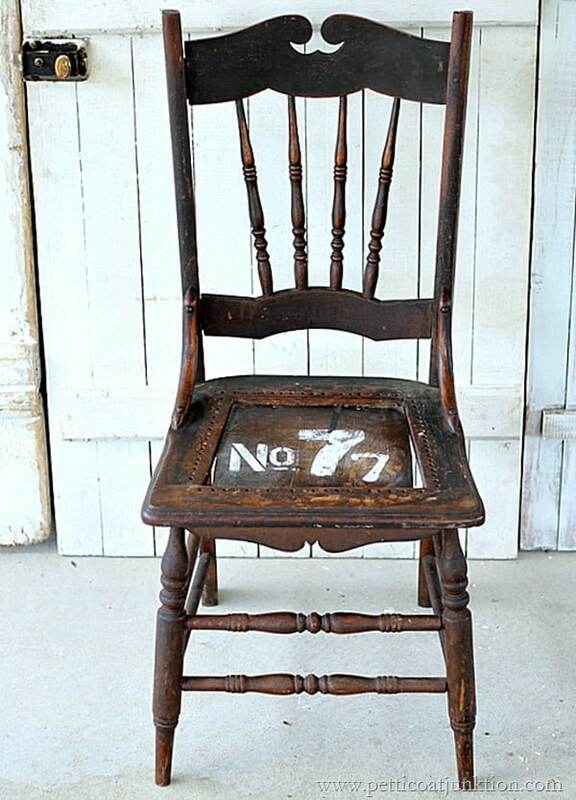 😉 And the chair has so much more character with the addition of your numbers. Great job as usual! OK you totally had me at the awesome table makeover Kathy! 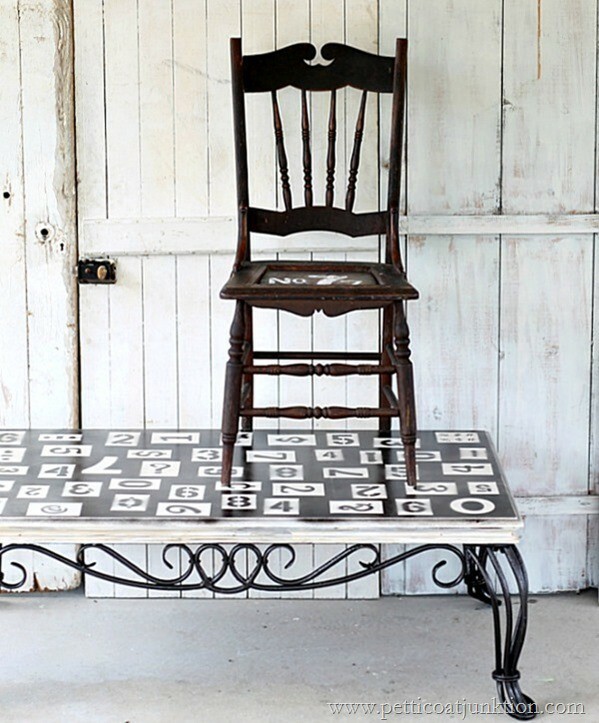 And then the chair…LOVE it! Thankd Therese. I really love that chair…with or without the stenciled numbers! I love both of these, Kathy! Especially that chair! And I agree that the thrift stores have gotten too expensive. Never thought I would say that! Thanks Angie..the chair is my favorite too! Ha! Chris…most of my readers want know what you’re talking about..but I do. Thanks Christy but I’m in awe of your chair makeover! I can’t decide which of your projects I love more Kathy! Awesome job on both! Thanks Shanna….the chair is my favorite. Thanks Jeanette…it took you long enough to join the tour….about time!! I’m working on my photography…thank goodness for editing software. You gave this table a great update! 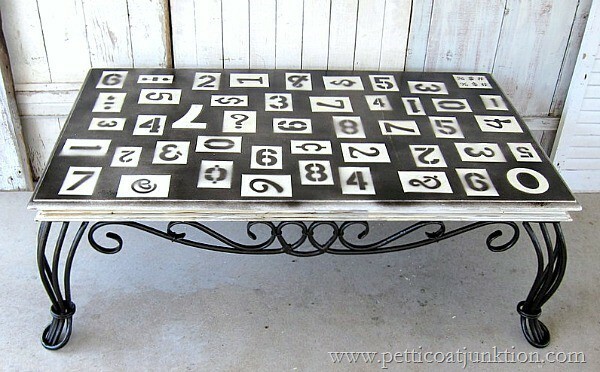 I love how you stenciled on a lot of numbers and how you applied them in different directions. I don’t think that this will last long in your shop. Thanks Connie and feel free to copy my stencil design 🙂 I wish you lived close too!